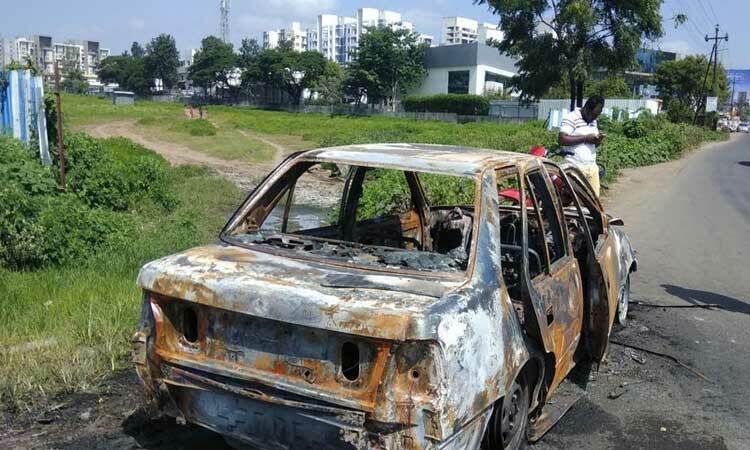 Pune : Np News Network – Six months after a 44-year-old woman was found charred to death inside a car in Hinjewadi, Pimpri-Chinchwad police on Friday arrested her brother who had killed her and then passed it as ‘killed in car fire’. The investigation had hit dead end but an anonymous letter mentioned that car was not ‘accidental’ and that her death was actually due to murder. The deceased has been identified as Sangita Manish Hiwale of Soundarya Colony in Nakhatevasti, Rahatani. Hinjewadi police station officials have arrested her brother John Daniel Borde (40), a mechanic. According to police, Sangita had got separated from her insurance agent husband. She lived with her brother John, with her 15-year-old son Samuel. There used to be frequent quarrel between Sangita and John over her expenses. She used to ask for money from John which had irked him. Sangita worked with a private firm but her earnings were not enough, police said. Around 9 pm, September 9, 2018, when Sangita asked for money for her expenses, there was again argument between them and John banged her head on the floor. Police suspect that she had died. To save himself from her murder charge and to get her insurance money of Rs 30 lakhs, John tried to fake her death. John informed their mother Maya Daniel Borde (65) and Samuel saying Sangita is suffering from low blood pressure and that she has to be taken to hospital. They were all travelling in a 13-year-old Maruti Suzuki Esteem, fitted with CNG. John had then made it look like the car caught fire near a showroom on the service road of Katraj-Dehuroad bypass between Bhumkar chowk to Wakad bridge.The incident was first reported at 1 am when the fire brigade got a call from an individual. When the fire was doused, the skull and skeleton was found completely burnt, by fire brigade and John had informed the firemen that his sister who was sick could not get out of the car, when it caught fire. John had then told police that they had gone to a hospital in Wakad, where the doctor asked them to take Sangita to Aditya Birla Hospital. As they were going, John noticed smoke coming out of car’s engine and soon there was fire. They jumped out of the car but Sangita could not come out. John and Siamon tried to take her out but in vain. They sustained minor injuries while trying to save her. Police had then registered it as a case of accidental death (AD) but could not make any headway. Few days back the cops received an anonymous letter alleging that Sangita was murdered. The cops began the investigation afresh and summoned John, who initially stood by his earlier statement but when confronted with several questions about his conduct on the night incident, he reportedly confessed to killing his sister. Now cops are saying that John had stopped the car and asked his mother to get out of it. He also came out and opened the bonnet of the car and called Siamon to stand there. John went back inside the car and poured petrol on Sangita and set her on fire. Police inspector Ajay Jogdand is further investigating the case.